“The consistency of my work lies in the expressive struggle to use the image as a bridge between the felt and the observed. I came to painting when I was 20 in the same manner as I have followed it’s path since; not through calculation or decisive choice, but through following an intuitive imperative; a need for a direction grounded in deeper emotional sources. One could say it chose me, but then I was born for it. Romantic feeling and imagination had always led me to seek out private and unique places, and the cream of this kind of feeling drove my painting, especially landscape for many years. It was in Morocco, on that same trip that the recognition of a path came to me, and it came immediately and in a completely rational moment of insight. I give credit to the profound experience of travel, and especially the completely sensual and immersed exotic experience of North Africa. Remember, this was 1971-72, a time when Europe, North Africa and the Middle East were relatively calm, traditional ways were still perceptible, and travel was cheap and safe. At the moment of recognition I felt that a life in which I could express as much of the mystery and magic around me would be acceptable and worthwhile. Stephen Scott was born in Saint John, New Brunswick. He spent a year in Europe following secondary school after which he studied Fine Arts at the Ontario College of Art, Toronto, Ontario 1972-73 and obtained a BFA from Mount Allison University, Sackville, New Brunswick 1978. He obtained a Master of Arts in Art Therapy from Concordia University, Montreal, Quebec in 1998. 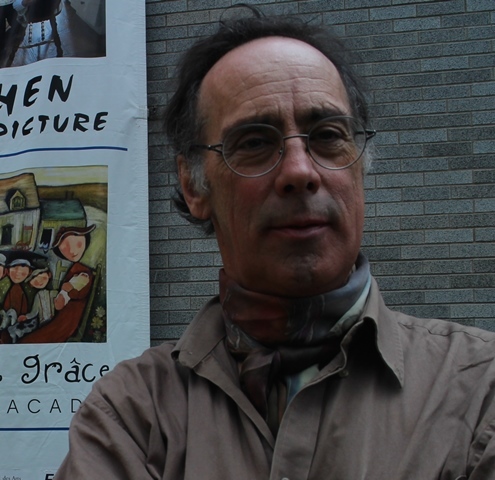 Stephen has developed his primary exhibition experience in east coast Canada. A sense of place is evident in his work, but travel has had a notable influence and has resided for periods in Antwerp, Belgium, Sweden and Germany. He currently maintains connections in Berlin, where he lived in 2003-2004 and 2005. Scott paints full time and resides near Fredericton, New Brunswick. Scott’s influences are wide ranging, from historical and contemporary Canadian, American and British realism to European historical and modern expressionist tendencies. The topography of Scott’s work contains in its complexities, a highly emotional, personal style. The evolution of Scott’s painting has shown numerous formal transitions while maintaining its core emphasis on subject, narrative and subjective representation. One basis for Scott’s work has involved a lifelong fascination for landscape, its power to evoke, and to carry a projection of mood. He works primarily in oils in an effort to dig as deep as possible into the significant image.